If you put one date in your diary this year make it Wednesday 26 June, and join CAFOD at an unforgettable event in London. It’s time to confront this climate and environmental crisis and tell our leaders that Britain should no longer contribute to the destruction of our common home. Climate change affects our health, our homes and our beautiful landscapes and things are getting urgent now. It’s time to tell our leaders that enough is enough. This is not the legacy that we want to leave for our grandchildren; this is not the future we want. As people of faith, we’re determined to speak up for our common home, and on Wednesday 26 June we’ll come together with over 100 like-minded organisations – members of The Climate Coalition – to speak to our politicians and make our voices heard. 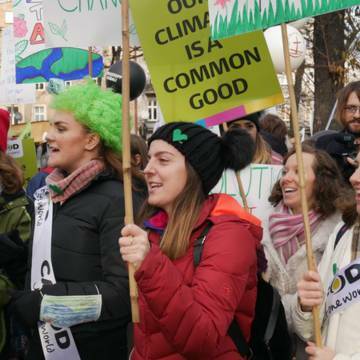 We’ll be gathering at Westminster to connect the poor to the powerful by sharing our concerns on climate change and the environment with leaders who can make a difference. Politicians will only increase their ambition if they see that we care. They will act if their constituents tell them that they want change. Join the Climate Pilgrimage by taking one of the coaches that are departing from various locations across England and Wales. The departure locations are listed in the table below. Please find your preferred location from where you would like to start your journey. You may book a coach from your preferred location even if this is not in your diocese. Using the Eventbrite page, please book your place on a coach from the relevant diocese. Download the current coach schedule for more information, but please bear in mind that all pick up locations and departure times may be subject to change. Before the day: If you've already signed up, download our lobby guide to help you plan your day. No need to re-register on the map, we've got you covered! Don't forget to invite your MP! Amend and send our template invitation as soon as possible so it's in their diary. From 9:30: For those travelling on their own and arriving early, there will be a number of interfaith events happening in the morning, before the lobby kicks off. Check out what's happening on Eventbrite. 12:00-13:15: CAFOD is participating in an interfaith event with Archbishop Rowan Williams from midday. If you would like to attend, you can find out more and register on Eventbrite. If you're joining us on a Climate Pilgrimage coach, you're already registered. From 13:00: Meet your MP from to discuss why you care about climate change and our common home. We'll keep you posted when a brief is available to help you with your conversation. 16:00: Close the day with a Mass to reflect and to celebrate our common home. The event is not ticketed, and there is no need to sign up in advance.